Any musical that has "The Musical" in the title is most likely adapted from a movie or TV show, and if you've read this blog before you know that's not my favorite kind of musical. 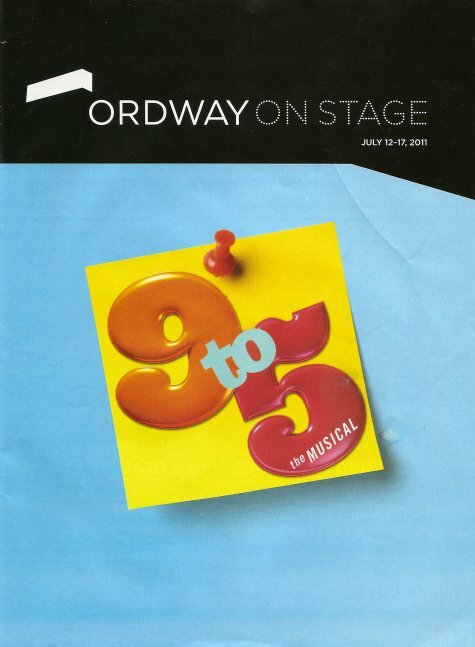 But 9 to 5: The Musical is the final show in an excellent season at the Ordway that included a super fun local production of Joseph, the Peter Rothstein-directed Guys and Dolls, and the brilliant and breath-taking original musical Next to Normal. So I went. And I love Dolly Parton; she's an amazingly talented and prolific songwriter and a smart woman (you have to be smart to play that ditsy). She wrote all new music for the score, except of course for the title song which was written for the 1980 movie. The book was written by Patricia Resnick, who co-wrote the movie script. I don't think I've ever seen the entire movie, so I can't say how similar the musical is to the movie. But as a musical I found it cute and funny in parts, with some great songs, but also at times silly (not in a good way) and over the top. 9 to 5: The Musical takes place in a workplace in 1979, when women were secretaries rather than administrative assistants, and were disrespected and underpaid. (As opposed to today, when there's perfect equality in the workplace. ;) Violet is the single working mother who has risen to the top of the secretary pool at Consolidated, but can't go any further. Doralee (the Dolly character) is the pretty and perky blond whom everyone assumes is sleeping with the boss. And Judy is the newly divorced woman who's stepping out into the workplace for the first time in her life. All three leads are great. The Tony-nominated Dee Hoty is the tough Violet who dreams of being "One of the Boys" (a woman CEO, can you imagine?) and tries to resist falling in love with the cute "junior accountant." Diana DeGarmo (an American Idol finalist whom I saw play Sheila in HAIR on Broadway last year) does a great job of imitating Dolly, even though at times it feels like a Dolly impression rather than an original character. It's quite remarkable how she transforms her strong voice into Dolly's high-pitched one and still manages to sound great. She sings about being judged for her looks in "Backwoods Barbie" (which Dolly recorded as the title track of one of her CDs). Mamie Parris is a powerhouse as Judy and has a nice arc, growing from the hurt and unsure new divorcee to a strong and capable woman who realizes she doesn't need a man, as she belts "Get Out and Stay Out!" The three completely different women bond over their hatred for their misogynist, hypocritical, thoughtless boss, Mr. Hart. He's a little like Parks and Recreation's Ron Swanson, only more sleazy and evil. Joseph Mahowald has a lot of fun with the role, and has a great voice as he proclaims his "love" for Doralee in "Here for You." Fed up with the jerk, the women fantasize about killing him, each in her own unique way. Instead, they merely kidnap him and hold him hostage while running the company themselves in his name. Their plan is to gather evidence that he's embezzling from the company to blackmail him into keeping quiet about the kidnapping. Meanwhile, productivity at Consolidated increases as all the employees are happier under the women's new leadership. The chairman of the board shows up (looking a little like Colonel Sanders) just as Mr. Hart escapes, and gives Violet Mr. Hart's job while shipping him off to Bolivia. Dolly shows up in video form to tell us what happens to everyone after the story ends, just as she did at the beginning to introduce the story. And everyone lives happily ever after. So it was a light and fun end to the Ordway season, if not the strongest show in the bunch. Similar to the "Broadway Across America" season at the Hennepin theaters, I decided not to renew my full season subscription at the Ordway so that I can focus more on new and/or local theater pieces. I saw The Addams Family on Broadway last year because of its stars (Bebe Neuwirth and Nathan Lane) and have no need to see it again. But I will definitely see the wonderful Fela! (which is so unique it almost doesn't feel like a musical, but more like a concert experience) and the Tony-winning Memphis. And I always like to see the Ordway originals (this year they're doing Rodgers and Hammerstein's Cinderella) because they're always quality productions filled with local talent.